Sylmar is a neighborhood in the San Fernando Valley and part of the city of Los Angeles. Known for experiencing sunny and warm weather that is famous across southern California, Sylmar offers many recreational activities to keep its residents outdoors. Hiking trails through Veterans Park give you access to some of the most beautiful views of the valley or you can spend a leisurely day at the El Cariso Golf course. The neighborhood supports numerous families so you will find a variety of houses, apartments, condos and HOA properties. Each of these buildings then has a different style, design, and material composition. 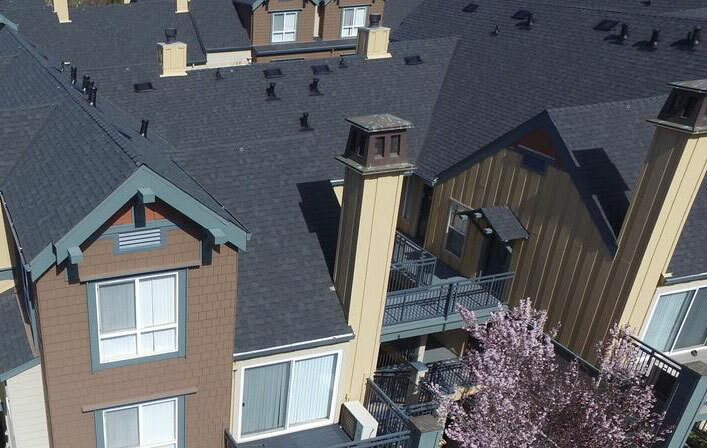 With so much variety available in HOA roofing, it is important to work with a contractor that has the appropriate experience. It is important that they know the best materials and styles to use for any given house in any given climate. Your first step is to develop a group of homes that have similar styles and roofing materials and decide how many you are going to put in each group. Depending on your location within the city, you may end up with a large group or small one, so it is important to get a roofer with experience across the board, to ensure you get professional and qualified work. Once the basics of the project are decided, you need to develop am RFQ which clearly states all your requirements. Remember to be as specific as possible and make sure you include the things that you must have compared to those things that would simply be nice to have. There must be an order of priority and importance to these requirements. When seeking a roofer, make sure they reply with bids by a specified date and that all bids are sealed. You need to ahead of time how you are going to rank the responses to each of the sections of the RFQ. The easiest way is to use a numeric system to rank them and once finished, you will have a ranked list of contractors, with the better-suited choices at the top of the list. Given that some contractors have different specializations, you may notice that a certain company is ranked higher on some lists than others, depending on the roof style and type. You now have a narrowed down list of top contractors that are best suited for your project. Th next step is to do some research; read reviews, check references and conduct interviews. The numeric evaluation combined with this collected information will lead you to make an informed decision. You will end up with a roofing contractor that will best meet your needs, work within your budget and be willing to listen and negotiate. Remember that finding a reliable and qualified roofing contractor for HOA projects can be time-consuming, but this is essential to assure you end up with a quality roof. We strive to provide the best services by a qualified and professional team ensuring your needs are met and commitments are kept.